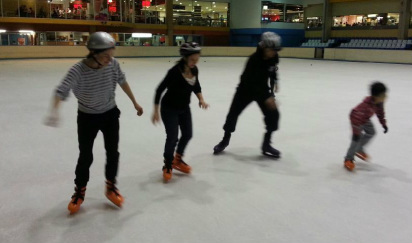 ​Speed skating classes are now taking place at Macquarie Ice Rink. Thursdays at 5:15pm and Saturdays at 8:30am. If speed is your thing, then this is where the action is to learn to skate fast. Whether you plan on becoming Australia’s next Winter Olympic medalist or if you just want to learn a more efficient skating technique, you are welcome to come and try this exhilarating sport. You can wear regular hire skates or your own figure or hockey skates. As your ability improves, we will get you geared up in speed skates. They have a long blade and will help you to glide over the ice fast. • A long sleeved T-shirt and long pants. • Gloves, knee pads and shin pads are recommended. $140 per 5 week term or $20 per session.